As a beginning collector, you should spend at least 15 to 25 per cent of the amount you are planning to invest in your collection in literature. The more you know about your collecting field, the less your collection will cost you in the long term. Join an association that is related to your hobby; buy special magazines and books. Books and articles that are out of print can be copied from other collectors. Old auction catalogs are especially interesting since they often show mass, manufacturer data and weights of medals, which can be useful for comparison. Literature in the form of rank lists and state manuals gives information on the award’s number of medals. A piece that was awarded only three times is perhaps obtainable on the medal market only every 20 years – or never. 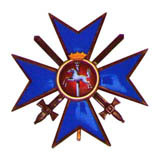 Shown on the left is an officer’s cross of the Braunschweig House Order of Henry the Lion with swards. That is such a piece. With only three proven awards, it belongs to the extra rare decorations in this area. Due to the very late award, related to the entire award period in the first World War, it probably was only manufactured by the court jeweler Hermann Jürgens. Few people can afford to collect everything. As a new collector, therefore, you should specialize early. Decide what you want to collect. There are many possibilities. Specialize, for example, in a topic like lifesaving medals or medals for art and science or those for one German state. 3. Collect from above downward! Do not buy 20 medals at $50 each, but rather one for $1,000. The less a medal costs, the more common it is, and the simpler to buy it. Rare pieces, however, come up infrequently. If you have the opportunity to buy a rare piece, give preference to it instead of buying several cheap and common pieces. That rare medal may never again be offered to you. Ask yourself, in this context, how much you want to spend on your hobby each year. 4. Examine each piece carefully! At collectors’ meetings and fairs, you should examine each piece that might be connected to your field of collection. Try to remember technical peculiarities of the different medals; note the differences of the pieces. Inform yourself about the applications to the medals, like oak leaves, swords, crowns, brilliants and so forth. World War I medals were made in a perfect way, even those manufactured only in silver gilt instead of genuine gold. 5. Keep in contact with collector colleagues! There are many other collectors who collect the same as you. Many of them are trustworthy and already have some experience in their area of expertise. Meet them and try to benefit from their knowledge. 6. Speak to visitors at Collectors' Meetings ! You might get the best things for your collection from your collecting colleagues. Many collectors bring their duplicates to collectors’ meetings – you chance to get something you may have been looking for for a long time. Furthermore, the meetings give you the chance to meet more experienced collectors. 7. Do not believe everything someone tells you! For most pieces, particularly rare ones, a history is given, which makes doubtful pieces better for sale. Trust only your own knowledge. A history may be fast invented for each piece. 8. Study, study and study some more! Never stop studying. The most experienced collector learns constantly. Talk with collector colleagues, and look at everything in their collection that you can. 9. Be careful with every purchase! Always keep in mind that as long as something is collected, fakes will be made.